Here’s our Sunday School lesson for this Sunday. Hope it helps! We meet in a large group when student first arrive. We will be acting out the story of the Prodigal Son. This provides a great example of a good earthly father and points toward our Heavenly Father. God is our Heavenly Father. He is forgiving; meets our needs; knows us; gives good gifts; is in control; and cares about our future. God is known as our Heavenly Father. What makes Him like a father? There are some characteristics of God that we will discuss today that you probably listed as those of a good earthly father. Remember that earthly fathers are human and make mistakes sometimes, but we can always count on our Heavenly Father. God knows what we need and meets our needs. God knows all about you. God is concerned about your future. Have everyone find Luke 15:11-31, in their own Bibles. 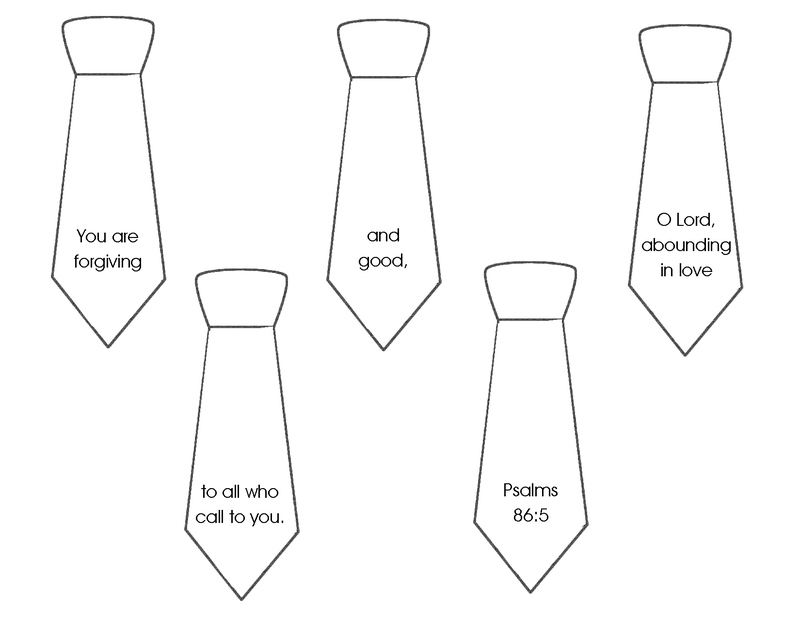 Use the neck tie sheet to put the verse in order. You can do this as a class, individually, or even have your students glue these in order on construction paper. Family Fun has some very cute cards for Father’s Day using scrapbook paper. There is scrapbook paper at church. Review the lesson above, especially if you have children who have just arrived. There will be some extra coloring pages on the cart on Sunday for you. Danielle’s Place (daniellesplace.com) has a great lesson on the Prodigal Son. I think we will use that for our skit during our large meeting time. thanks for posting this lesson. I had a last minute change as father’s day slipped our minds till the last min. We have the added issue of a new family that has come from a pretty messed up home life so your lesson on God as your father is just perfect and I can use it by also including the attributes of grand dad. thank you so much.